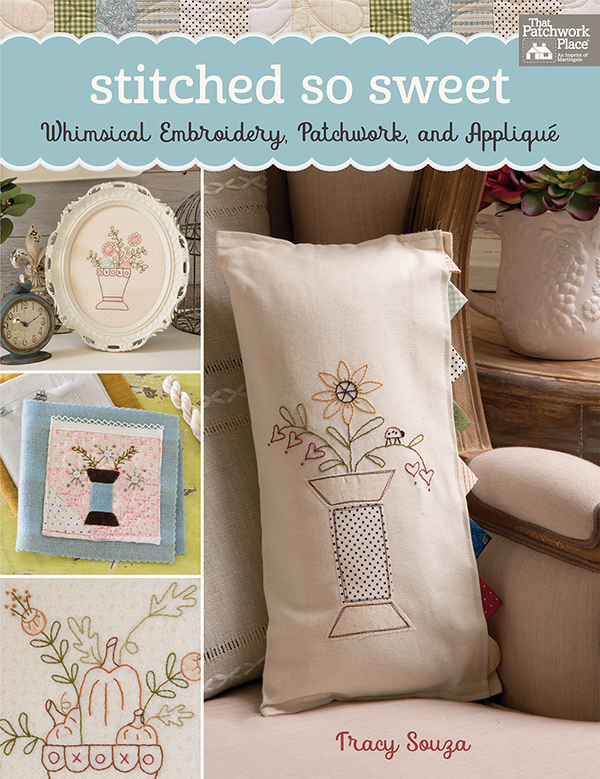 Simple sewing is always in season—especially when it’s Stitched So Sweet! In this new book from designer Tracy Souza of Plum Cute Designs, you can showcase seasonal delights in quick-to-sew projects featuring sprinkles of embroidery, patchwork, and appliqué. Playful motifs capture everyday pleasures, from springtime flowers and buzzing bees to plump pumpkins and frosty snowmen. Charming touches such as prairie points, wool appliqué, and big-stitch quilting give each design its pop. To a four-season quilt, table topper, and wall hanging that can be enjoyed year-round. And the difficulty level? Patterns are simple enough for confident beginners to easily complete! Reading this post in email? 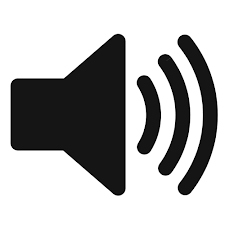 Click here to hear our interview online. During the interview we asked Tracy what was on her sewing table; she sent us a pic! Tracy’s busy getting ready for Quilt Market in May! What’s your favorite way to stitch the seasons? Tell us your answer in the comments for a chance to win a copy of Stitched So Sweet! We’ll choose a random winner one week from today and let you know by email if you win. Good luck! And if you’re ready to start stitching with Tracy now, you can purchase the book at our website and we’ll send you a link to instantly download the eBook for free. We’ll email you about your prize, Gracie—congratulations! Definitely All of the Above!!! I love any kind of stitching! Patchwork, I believe, is my favorite; however, I would love to get back into embroidery. This book looks too cute to pass up! Thank you. This looks like a great book, I look forward to making the projects. Thanks for offering the giveaway. I love mixing it up so I do patchwork, embroidery by hand and machine and I do appliqué. By dog all of these things I am always looking for new ideas to try. I love to stitch the seasons with both applique and patchwork. As the seasons change, it is fun to look through my closet for past projects with which to freshen up my decor and bring back good memories of past years. I mostly love appliqué but am intrigued wit the mixing it with embroidery. Embroidery is my go to stitching. 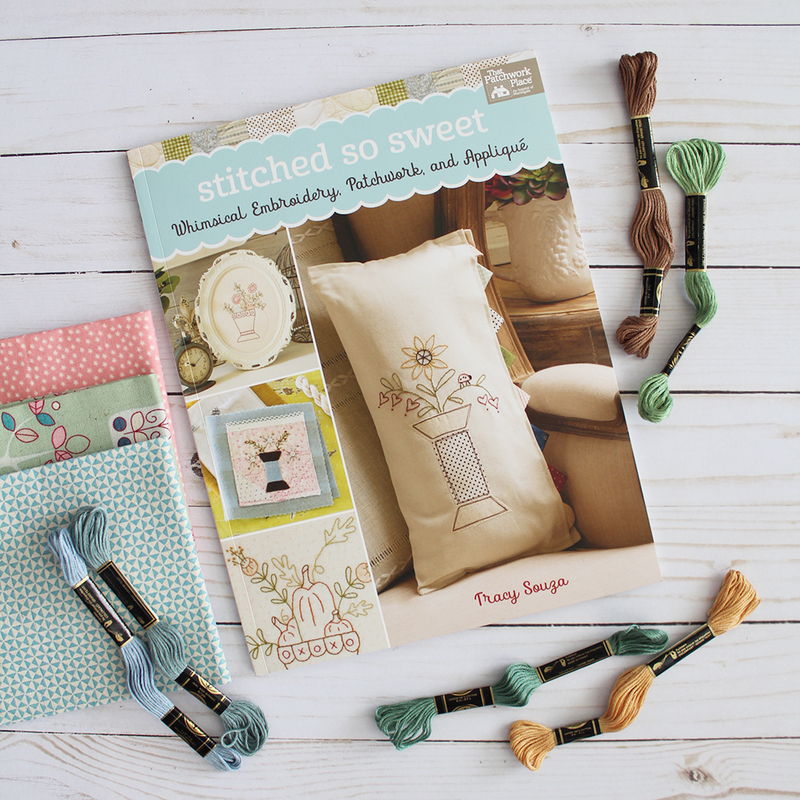 Thanks for the chance to win a copy of Stitched So Sweet! All the above, I love doing handwork of all kinds. Embroidery, redwork, working with wool applique, crazy quilting, learning Brazilian Dimensional Embroidery, I love it all. My grandmother taught me to embroider when I was young. I’ve recently started to add embroidery to my patchwork and love it! I like all of the above and I have all of the above in my home! I love doing little projects like these. This book I know I need in my group of books. The threads looked so pretty also. All the above! These are such sweet designs. Definitely All of the above. Love to work with fabric and thread!! I love all three, but redwork embroidery is my favorite. I love to do it all! All the above: always try to add embroidery and applique to my quilts, if not to the front, I do it on the back and the label. My favorite was a mom a dad and two baby birds for my friend’s 2nd baby… I haven’t done stitching just for its own sake for a while, and I have loads of hoops and frames just waiting! All of the above! Thanks for the chance to win. patchwork and applique are my pick for seasonal projects. I do patchwork, and embroidery and have just started to to applique. I like all three but embroidery wins out more often than not. Thx. ALL of the above tho I’m presently enjoying a return to embroidery. This is a lovely book! I would love to have my name drawn 🙂 Thanks for the opportunity. All of the above! Cute book with fun ideas! My favorite way to stitch for the season is to make a quilt with Applique in each block. I love to applique! I’m just starting to make some seasonal quilts for my walls. I love the look of patchwork and applique I together and also wool embroidery. What a sweet looking book! All the above. Love them all. 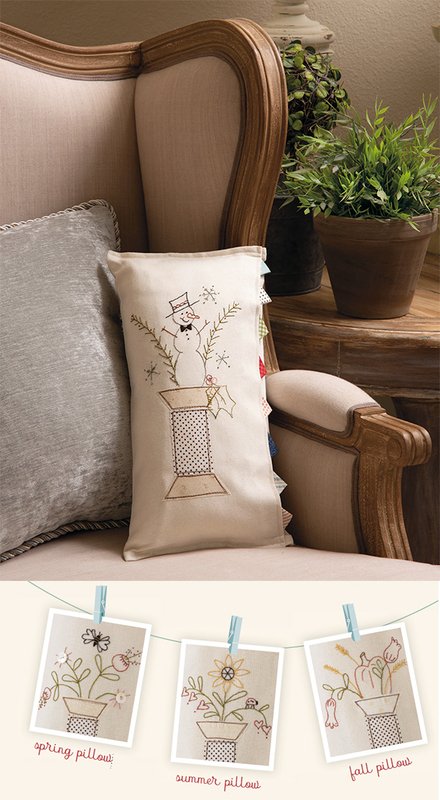 I usually do patchwork, but I would love to make some seasonal embroidery projects. This book would inspire me! I like to combine patchwork with embroidery. Would like to start adding appliqué too. Love the ideas shown in Tracy’s book! I prefer patchwork. Applique is my second choice. I love to stitch the season’s with either embroidery or wool applique. Love the fall colors and after long winters here in Michigan I can’t wait for the soft pastels of spring!! Definitely "all of the above"-I love them all!Thank you for the chance to win a copy of this gorgeous book! Patchwork is my current way to stitch the seasons, but I’d really like to get back to embroidery – it must be 40 years since I’ve done any. 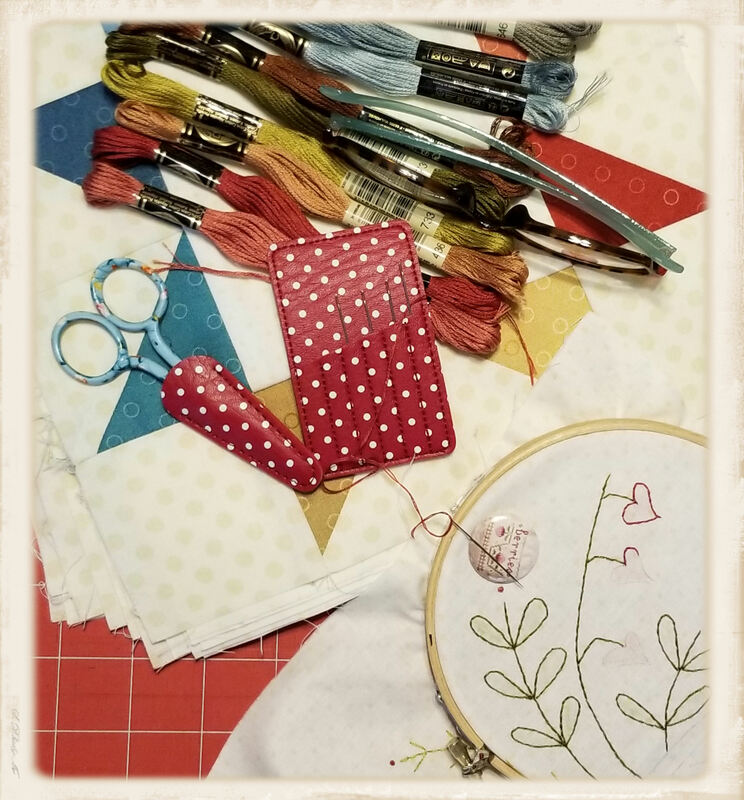 I’d really like to have handwork that I can take with me, and I love the look that embroidery can contribute to quilts, cushions, and other projects. I love to do it all! I have recently become addicted to appliqué. Now I need to get Tracy’s lovely book to make her sweet designs. All of the above and just love this book as the patterns are really cute and I am always looking to purchase new patterns and books for hand embroidery!! I love both embroidery and applique. Love the designs. I too am returning to more hand work having just recently retiring. I like patchwork with a touch of embroidery. Thanks for the intro to the book and the giveaway. While I have done all my first choice would be applique. All of the above! I like to have embroidery to keep my hands busy when I’m watching TV. I have really gone deep this year into hand embroidery, this style is exactly what I enjoy. I learned embroidery when I was about 5 from my mom, did some off and on and now, It is the thing to do. I have work put together in each vehicle, in the travel trailer, next to my recliner and down in my craft room. Constant work in progress. I’m kind of an "all of the above" gal. For Christmas, love the look of a bright Christmas-y fabric quilt thrown over a chair or wool applique pieces on the wall. All of the above! As I’m getting older it gets more difficult, but love to do embroidery and have since I was 14! Stitching is like the seasons… it changes. I love all handwork but I guess patchwork is my constant. All of the above! Although I have quilted exclusively for the past 15 + years lately I have gotten back into embroidery and am loving it. All of the above! I need to add this book to my collection! Love it! All of the above! Love the book! I love all kinds of needlework. Oh my goodness, all of the above! I love mixing them together, too! Would love to win this book and try these cute projects! Oh, I love all kinds of sewing. It is nice to do some of this and some of that. All of the above! I like to change it up every now and then. Right now, I’m doing embroidery. I love all seasons. Some designs just ‘tell’ me what to do. I would have to say all of the above. I love doing embroidery, wool applique, and also machine applique. I enjoy doing seasonal work because there is always something fun to work on! Love Tracy’s designs, I’ve done several. I do a lot of applique and embroidery and really looking forward to adding this book to my collection. I love to do the seasons in embroidery. All of the above, although that brings with it a whole new level of messiness. My sewing room is shrinking with each new idea I get. All of the above. I love filling my home with "little treasures" of handwork! Patchwork and embroidery. Applique, not so much. My favorite way to celebrate the seasons is embroidery and cross stitch. All of the above! Beautiful designs! My favorite is embroidery in a patchwork project. Thanks for the chance to win this book. I love embroidery! Thanks for a chance to win Tracy’s book. 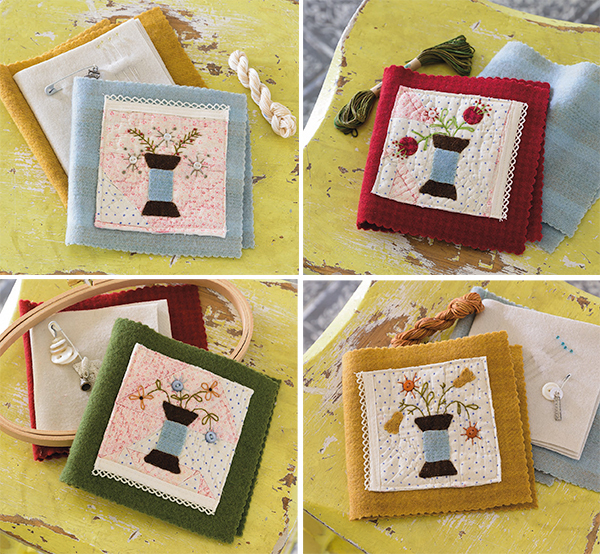 I lean towards embroidery with a little applique so Tracy’s book is perfect for me. So glad I was able to meet her at Road2ca this January and get her to sign her book for me. Such a delight! Patchwork and embroidery are my choices. Wool applique is great, but regular applique is not my chosen craft. I prefer patchwork. However, I have done embroidery and counted cross stitch. I might do it again if I won this book. Patchwork is a favourite, but embroidery is something I have lived to do since I was a child, an now I like to incorporate them together. I have enjoyed all these crafts but at the moment I am into patchwork. All of the above. I currently like combining applique and embroidery, but have embroidered pieced quilts as well. I like to do applique when I am sewing seasonal things. I love incorporating all 3! OH man, I have to say all of the above! Love the combination of simple embroidery and applique on cotton or wool. Tracy’s designs are enchanting. I love a combination of embroidery and patchwork. Tracy’s projects really are "stitched so sweet." All of the above, but mostly patchwork. All of the above! Stitched so Sweet looks like a great book. Embroidery is my favorite way to stitch the seasons. Thank you for introducing me to this author and book. All of the above. I just need more time to get some of my many projects finished!! I love emroidery but often I end up doing patchwork. Hands down, I love embroidery…slow stitching is the best, especially when I have beautiful patterns. Just starting to crosstitch again after years of not doing it….there is so much inspiration out there on Facebook and Instagram. Would love to have a copy of this book. I love all those mediums! Patchwork’s is so cute. Embroidery is so reminiscent of my Grandma. Applique is something new I’ve been trying. Patchwork is my favorite—so far! I like to use all the different methods of stitching! I like to combine embroidery with patchwork. Mostly patchwork with a little bit of embroidery. I love to combine embroidery and quilt patterns. Sew much fun! Absolutely all of the above! Love all of the above ways of stitching. I enjoy embroidery combined with applique. Patchwork is my favorite. Thanks for the chance to win! I have liked doing embroidery work all my life since my grandmother taught me some stitches when I was about eight years old. I consider myself an excellent stitcher. I have offered to do any embroidery work that my fellow quilters might not like doing in their projects. Some have taken me up on my offer. It is a fun thing to do. All of the above.Thank you for offering a really cute book. My favorites are all the above. I love Tracey’s work, it’s beautiful. Thank you. Hand embroidery is my favorite for the seasons. 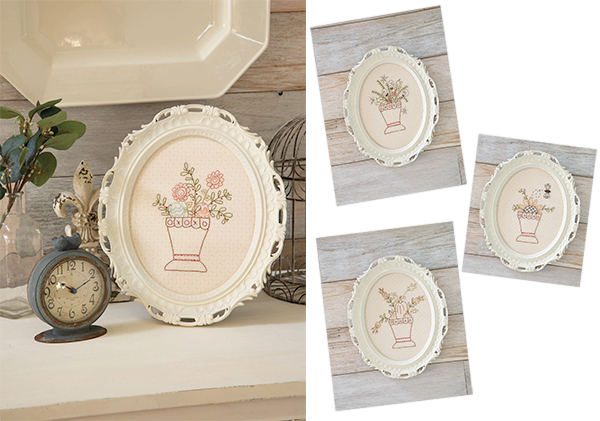 Not only does it look vintage but makes the item embroidered have that "touch" of class one achieves with the embroidery. All of them! How can one resist? I do all of the above. I like something in my hands todo in the evening so I do a lot of handwork. During the day when I an be in my studio I piece art quilts. I am teaching a class tomorrow on silk ribbon embroidery. Applique’ but I’d like to learn hand embroidery. I love to make quilts using patchwork, but it always makes it more special when I include some embroidery in each project. It makes it more personal! All of the above – sometimes in the same project! Patchwork embellished with Applique and embroidery is the most fun! Love to embellish patchwork with Applique and embroidery! The book has some wonderful projects for those of us that enjoy handwork. Using a machine is great and practical, especially if the item is going to get lots "abuse" with frequent washing… but construction and embellishing a item totally by hand is a process of joy and relaxation. What more can you ask for??? Satisfaction in the process and in the final product. All of the above in that order and thanks for a chance to win the book! Patchwork embellished with appliqué or stitchery. Patchwork is my favorite, but I enjoy many kinds of crafting. All of the above. What a lovely book. Patchwork is my favorite, but I still do cross stitch once in awhile. Working on a cross stitch pattern of a quilt hanging on a clothesline. I love to stitch the seasons with embroidery and patchwork. I love many of the projects in this book. Patchwork would be my choice–but applique and embroidery would also add to the fun. I enjoy embroidery most of all. All of the above! I like variety. Embroidery keeps me stitching year round! All of the above. I have done all three. Thanks for the giveaway. embroidery any way it works for the project. Most definitely embroidery…it’s so relaxing, and you can easily take it anywhere. Thanks so much for the giveaway! I love to do seasonal embroidery & especially like to combine it with piecing. Can’t wait to get this book & start stitching. All of them. I probably do more Patchwork but love the look of appliqué and embroidery. I love all of them – patchwork, embroidery, and applique. What a wonderful book and a talented lady. For me it would have to be "All of the above"
All of the above! The only season I stitch for is Christmas. All of the above…but really, I prefer piecing. I do enjoy an occasional appliqué and embroidery project, though! as well as a BOM from my LQS. Patchwork and a little applique. I am wanting to do some embroidery, but have yet to try.